Celebrating with the official UK Surf Pro Tour beer, Sharp’s Atlantic Pale Ale, Jobe Harriss delivered an outstanding performance to take the English Champion mantle at the English National Surf Championships this weekend. 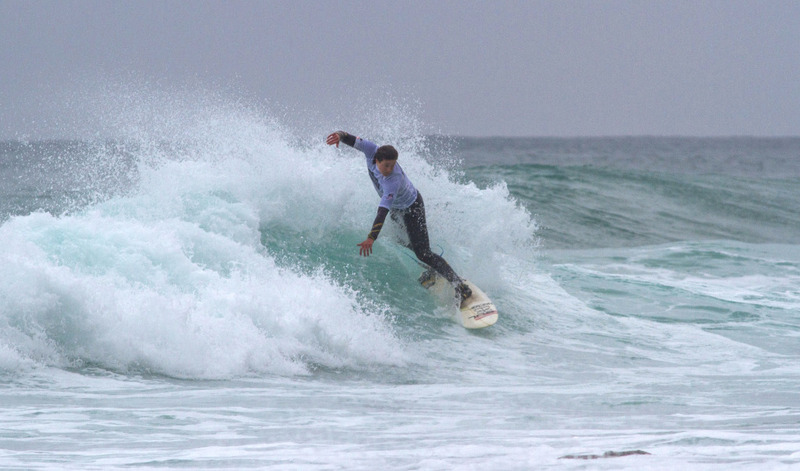 Held at Watergate Bay on Saturday 2nd, Sunday 3rd and closing with an epic final on Monday 4th, spectators were treated to spectacular surfing from the Junior, Longboard, Senior, Women’s and Men’s divisions. The blustery bank holiday weekend saw the English National Surfing Championships put the countries best to the test. The waves ranged from small and choppy on Saturday morning to overhead, clean and perfect for the finals on Bank Holiday Monday. Led by the UK Pro Surf Tour, which is sponsored by Sharp’s Brewery as an extension of its ‘There’s an Adventure Brewing’ campaign, The English Championships was implemented in partnership with Andy Sturt of the ESF and Brender Wilmott and her team of students from Cornwall College. The English Surfing National Championships is the first major event of the season and also reveals whose winter training has been the most effective. As well as the national title, the surfers are competing for the chance to represent England at the upcoming European Surfing Championships in Morocco this October. The final of the Sharp’s Brewery Open events saw three of Newquay’s finest take on Bude’s Jobe Harriss. After only eight minutes it was a one horse race. Harris opened his account early and clocked up 4 good scores while Mark Harris, Luke Dillon and Alan Stokes hunted for their openers. 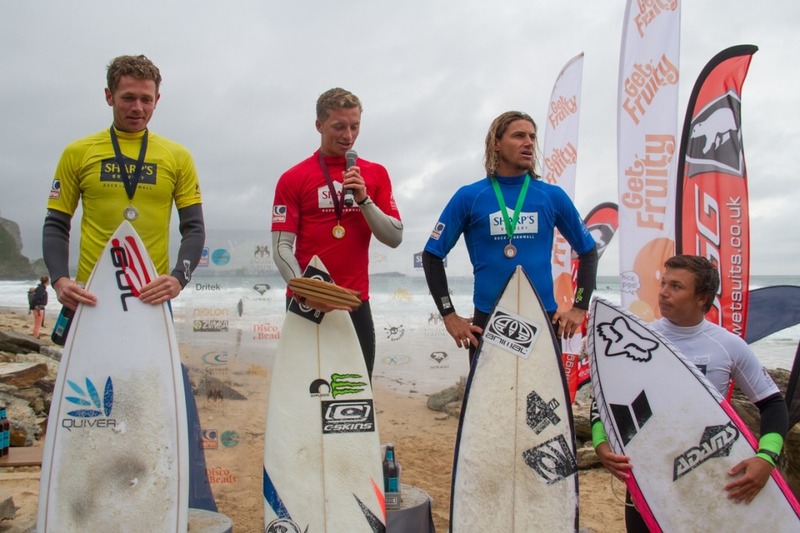 Luke Dillon fought back with an excellent wave but couldn’t back it up and had to settle for fourth place. Alan Stokes launched the biggest aerial move of the event but came unstuck on the landing, which cost him the title. In the closing minutes, Mark Harris put together a combination of four big turns to jump to second place and narrowly miss out on the title. But it was Jobe Harriss who showed that he is the surfer to beat at the moment, announcing that the new guard of young water sportsmen has officially arrived. Sponsor, Sharp’s Brewery also awarded surfers with the overall highest wave score of the event, with Josh Ash claiming that title for the Men’s and Lucy Cambell for the Ladies division. The event sponsors provided a relaxing beach vibe for spectators and surfers with music from the Red Bull beach buggy and Sharp’s Brewery providing free tastings of one of the regions fastest growing beer brands, Atlantic Pale Ale. Live surfing commentary by Nick Williams, ensured those on the beach were kept constantly informed of the action in the water. An extensive list of sponsors and supporters for the event included Sharp’s Brewery Cornwall College, Fetch Surf Co, The Dritek Hanger, Snugg Wetsuits, Niglon, Zumba Fitness, Checkered Photography, Fistral Beach Extreme Academy, Disco Beads, Get Fruity, Boneyard Clothing and Red Bull. Sharp’s Brewery’s has just launched a new ‘There’s an Adventure Brewing’ surfing campaign with South West big wave surfer Andrew Cotton. People across the country have the chance to win a trip to Ireland or Portugal to watch the man himself surf the world’s biggest waves, as well as attend a surf training camp at his home in North Devon. Visit www.sharpsadventure.co.uk to enter and keep up to date on social media via Twitter @SharpsBrewery and Facebook at www.facebook.com/sharpsbreweryuk.